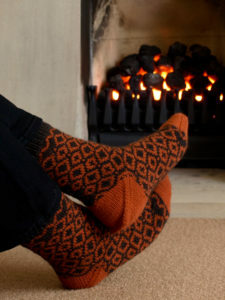 The tiled floor of an English priory inspired the colourwork pattern for these socks which are knitted in the round from the cuff down with an afterthought heel. Charts for the colourwork pattern are included. 34 stitches × 40 rounds = 10cm (4″) in stocking stitch in the round. 34 stitches × 30 rounds = 10cm (4″) in stranded colourwork in the round. Socks shown in size M using Knit Picks Palette (100% wool; 211m / 236yd per 50g skein); colour A: Bittersweet Heather, 1 skein; colour B: Marsala, 1 skein. You can change your mind at any time by clicking the unsubscribe link in the footer of any email you receive from us, or by contacting us at newsletter@yellowgingerdesigns.co.uk. We will treat your information with respect. For more information about our privacy practices please visit our website. By clicking below, you agree that we may process your information in accordance with these terms. Sign up to be kept up-to-date with the latest news, new patterns and special offers. Emails are roughly monthly and I won’t spam you or share your address with anyone else. To say thank you for signing up you will also receive a free copy of my Ways to Wear Knitted Shawls ebook.